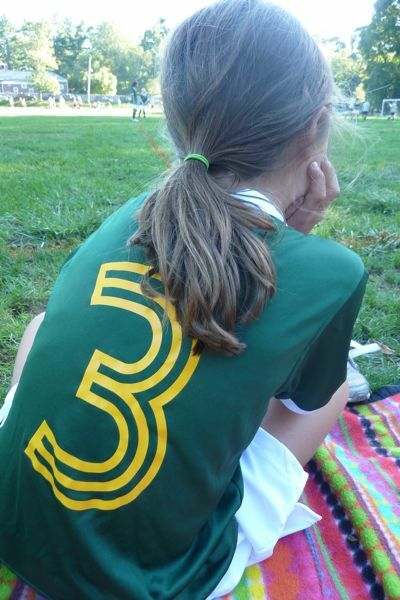 On Saturday afternoon — a gorgeous, unseasonably warm one in New York — I was sitting with some moms on the sideline of Phoebe’s last soccer game of the season. In a conversation interrupted every two minutes with a cheer for whichever formidable 8-year-old was rocketing down the field with the ball, we discussed the merits of our coach’s European-style alignment (only one forward! ), we discussed grand plans for our soon-to-be soccer-free weekends, and, of course, we discussed Thanksgiving sides. Technically I had been having the Thanksgiving-side conversation with one of the moms for three straight weeks. 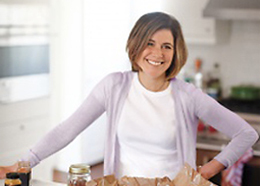 It seemed like every time we ran into each other –at the farmer’s market, at the away game in Chappaqua (where we crushed, btw), and on the night she and her husband cooked the happiest, market-freshy-est dinner for my family — she was plotting a dish that would be substantial enough for her vegetarian Thanksgiving guests. The pressure was on because she had gone ahead and killed the year before — some sort of baked polenta with mushrooms — a fatal error because now that she realized she had to top herself. It was so delicious, she kept telling me. So special! “So why not just make it again?” I asked her the night at their house. “Yeah,” she said. “I guess I could.” But I could tell she thought this idea was uninspired. Lazy. Total loser move. Here’s the thing: Repeat dishes are only uninspired and lazy if they’re not good. Repeat dishes that are so memorable you’re still talking about them a year later in a tone usually reserved for George Clooney, are the opposite of that: They are Signature Dishes. 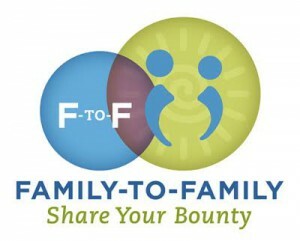 This is what the holiday family table is about. 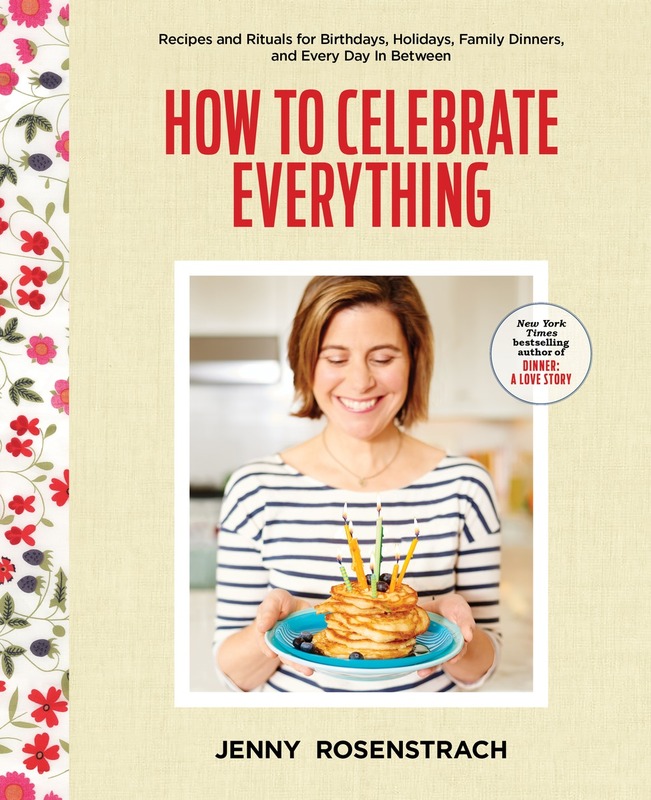 I don’t know about you, but in 10 years I want to get that call from Phoebe when she’s in college (playing midfield for UNC, natch) begging me to make her favorite confetti brussels sprout dish when she returns home for break…because what kind of Thanksgiving would it be without that on the table? Anyway, I think I convinced my friend while we cheered on our girls. (Final Score: 3-0; the good guys.) I’ll find out for sure and report back to you — and try to nail down the polenta recipe for you, too. To make this vegetarian, just skip the bacon and add a few more more glugs of olive oil before you saute the brussels. Using a food processor fitted with the shredding disk, slice 1 1/2 pounds of brussels sprouts. Meanwhile, fry 3 pieces of thick-cut bacon in a large skillet. Remove bacon and chop into small pieces. Using a paper towel, soak up some of the bacon fat from the pan and add a little olive oil. Add 1 clove garlic (minced), 1/2 medium onion or 1 small shallot (chopped), salt and pepper. Add brussels sprouts and saute about 1 minute until coated with oil and slightly wilted. Add 1/2 cup chicken or vegetable broth and cook another 5 minutes. 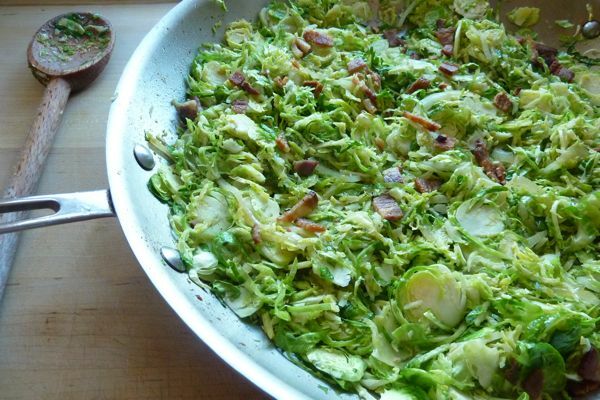 Remove brussels to serving platter and sprinkle with bacon pieces. 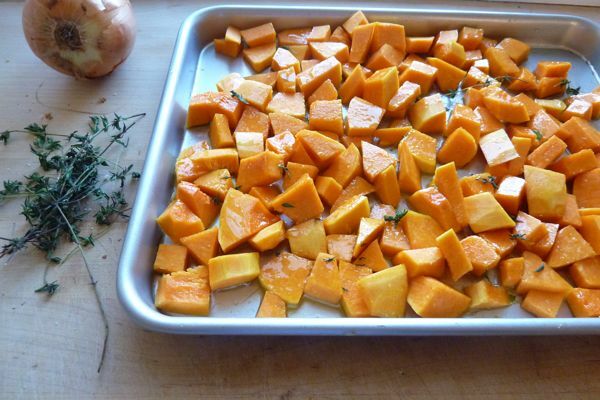 On a cookie sheet, toss 1 small butternut squash (peeled, seeded, and chopped into small pieces as shown below) with olive oil, salt, pepper, and a teaspoon or two of fresh thyme leaves. Roast at 425°F for 35-40 minutes. Meanwhile, in a large bowl, toss about 8 cups baby arugula, 1 cup cooked beluga lentils (you can buy these precooked at Trader Joe’s), a handful of crumbled feta, and a handful of storebought candied pecans. Make dressing: Whisk together 1/3 cup white balsamic vinegar, 1/2 cup olive oil, salt, pepper, snipped chives. When squash is ready and has cooled, add to the salad and toss with vinaigrette right before serving. 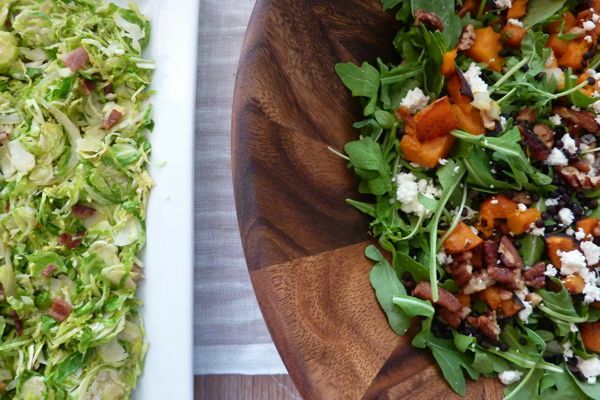 What to do ahead of time: Make dressing, wash greens, chop up squash. I was just told that Thanksgiving is at my house, but the saving grace is that it is potluck style – I am just in charge of turkey, stuffing and cranberry sauce. Unfortunately the cranky aunt is assigned to bring salad and I know this one would not make the cut. She’ll probably make the same salad she always makes, which is good but not on the same level as this butternut squash salad. That recipe will be making our rotation at some point this month. Wait, what if I have pecans already and don’t want to buy additional candied ones? Do you have a suggestion for a good candied pecan recipe? The one I usually use is sweet and spicy – not sure it would really work with the arugula. And since I have 20 lbs of CSA-supplied winter squash staring at me every day as I try to think up something for dinner, this recipe looks fabulous. p.s. As an enthusiastic reader who lives more than 200 miles from the nearest Trader Joe’s – no really, there still are places like that – I’d often appreciate links or suggestions to make my own of something that you pick up there. Thanks! I love all your brussel sprout recipes. I’ve always been afraid of the brussel sprout (and I’m a pretty happy veggie eater) but now I’m eager to give them a try. the polenta recipe sounds like one I spied on Raising Foodies quite awhile ago. It was made with a crockpot (which didn’t work so well for me as mine cooks really, really fast and I can’t find anything here execpt instant polenta) but uses goat cheese and mushrooms and is really fabulous. Check it out. Then post the baked one and we can compare! The “more adventurous than my family” comment mad me laugh. We go to my sister’s house and “adventurous” was that I brought pumpkin cookies intead of chocolate chip. 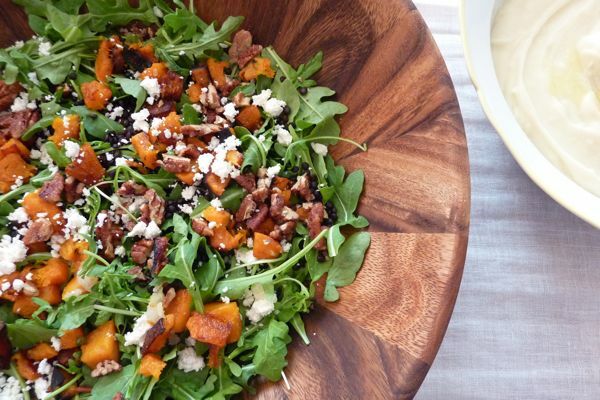 Love, love, love the butternut squash salad! I just made a twice-baked butternut squash, which I would serve at Thanksgiving if I hasn’t already celebrated it. It’s a signature dish for sure, and I think every family needs one of those. I think I’m finally inspired to make brussel sprouts on Thanksgiving. Thank you. So you don’t cook the brussel sprouts? I’ve never cooked (or eaten..) them before but I keep psyching myself up to try them. I love(yes, love) your wedsite and I check it most days. I am going to add both of your greens dishes to my holiday table. Love the idea of ‘signature dishes!’ I agree, she should totally make that again. I tried the brussels sprouts last night; had never done the fine slicing in the food processor before, and it made a huge difference in both prep time and cooking time. Didn’t use bacon, but did dress up with lemon zest and a can of mandarin oranges. Really, really tasty, and so quick. Thank you! Love love love brussels sprout salad. This post made me so excited for TGiv where without a doubt, brussels sprouts are on the table! YUM. We are trying the Confetti BS! Love the idea of signature dishes. That is a great way to reframe menu planning. Love the “signature dishes” ! I recently found your blog and am so glad I did. I tried the Confetti Brussel Sprouts last night and loved them! I ommitted the bacon as we are veg. and I added lots of diced roasted garlic and red pepper flakes with my sliced onion. The best BS I’ve had. I never would have thought to stick the BS in the food processor. Thanks so much! We are eating Thanksgiving with friends, and I am making the brussels sprout with bacon. Yum! Can they be reheated or do they need to be prepared on-site? Did the brussels sprouts today and they were the hit of Thanksgiving! So easy to do at the last minute and everyone loved them, even my husband who previously claimed he didn’t like brussels sprouts. They were the perfect addition to our T-day meal. This recipe was amazing! I had company over for brunch and this was the perfect salad to go with quiche. Thank you!